Head’s writing style lives up to his nickname of “Galloping Head”. To our modern ears it comes across as breathless and overwritten; however, it is a valuable contemporary record of the new town. A word on the Refreshment Rooms. In the 1840s they were something of a contemporary marvel, much as the Fortes Motorway restaurant was at the opening of the M1, 120 years later. Trains were slow by present day standards – the original timetabled journey between Euston and Wolverton was 3 hrs 15 mins. These times slowly came down in the 1840s and rather more dramatically with the more powerful engines of the 1850s and 1860s, and the Refreshment Rooms went into decline as passengers no longer needed to stop at Wolverton. Head’s description illustrates the Refreshment Rooms in their heyday. Flying by rail through green fields below Harrow Hill and thence to Watford,—stopping for a moment in a deep cutting to hear a man cry ” Tring !” and a bell say ” Ring!” until the passenger gets so confused with the paltry squabble that he scarcely knows which of the two competitors is vociferating the substantive and which the verb,—we will now conduct our readers to the Station and little town of Wolverton. A.M. goods up,” on the tender of which lives the ruddy but smutty-faced young fireman to whom she is engaged. The blacksmith as he plies at his anvil, the turner as he works at his lathe, as well as their children at school, listen with pleasure to certain well-known sounds on the rails which tell them of approaching rest. The workshops at Wolverton, taken altogether, form, generally speaking, an immense hospital or ” Hotel des Invalides ” for the sick and wounded locomotive engines of the Southern District. We witnessed sixty of them undergoing various operations, more or less severe, at the same time. Among them was Crampton’s new six-wheel engine, the hind wheels of which are eight feet high, weighing thirty-eight tons, and with its tender sixty tons. It is capable of drawing at the usual speed twelve carriages laden with passengers. The workshops at this station are so extensive, that it would be tedious and indeed almost impracticable to describe them in detail; we will therefore merely mention that in one of them we saw working at once by the power of an 18-horse steam-engine twelve turning-lathes, five planing-machines, three slotting-machines, two screw-bolt ditto— and, as a trifling example of the undeviating accuracy with which these contrivances work, we may state that from a turning-lathe a shaving from cold iron will sometimes continue to flow for forty feet without breaking. There are a large cast-iron foundry, a brass foundry, machines for grinding, and also for polishing ; sheers for cutting, and stamps for punching cold iron as if it were pasteboard; an immense oven for heating tires of wheels; a smith’s shop containing twenty-four forges, all of which were in operation at once. Two steam-engines—one for machinery, the other for pumping water for the town and offices only, for the Company’s well-water here, as at Camden Station, disagrees with the locomotives. A large finishing store, in which were working by steam fifteen turning-lathes, five slotting-machines, five planing ditto, one screwing ditto, two drilling ditto, two shaving ditto. Beneath the above we entered another workshop containing sixteen turning-lathes, two drilling-machines, one slotting ditto, one screwing ditto, one nut ditto, one cylinder-boring ditto, one shaping ditto. In the great store-yard there is an hydraulic press of a power of 200 tons for squeezing wheels on to their axles, or wrenching them off. Another workshop is filled with engines undergoing repair, and adjoining it there is a large store or pharmacopoeia, containing, in the form of oil, tallow, nuts, bars, bolts, &c., all the medicine which sick locomotives occasionally require. At a short distance towards the south we entered a beautiful building, lighted during the day by plate-glass in the roof, by gas at night, and warmed by steam. In its centre there stands a narrow elevated platform, whereon travels a small locomotive, which brings into the building, and deposits on thirteen sets of rails on each side, twenty-six locomotive engines for examination and repair. On the outside, in the open air, we found at work what is called ” a scrap drum,” which by revolving cleans scraps of old rusty iron, just as a public school improves awkward boys by hardly rubbing them one against another. The scrap iron, after having been by this discipline divested of its rust, is piled on a small wooden board for further schooling, and when sufficiently hot the glowing mass is placed under a steam-hammer alongside, whose blows, each equal to about ten tons, very shortly belabour to ” equality and fraternity ” the broken bolts, bars, nuts, nails, screw-pins, bits of plate-iron, &c., which are thus economically welded into a solid mass or commonwealth. In another smelting-shop, 150 feet in length, we saw at work fourteen forges, six turning-lathes, one drilling-machine, and one iron shaving machine. Lastly, there are gas-works for supplying the whole of the Company’s establishment with about seventy or eighty thousand cubic feet of gas per day. The above is but a faint outline of the Company’s hospital at Wolverton for the repair and maintenance merely of their locomotive engines running between London and Birmingham. The magnitude of the establishment will best speak for itself; but as our readers, like ourselves, are no doubt tired almost to death of the clanking of anvils—of the whizzing of machinery— of the disagreeable noises created by the cutting, shaving, turning, and planing of iron—of the suffocating fumes in the brass-foundry, in the smelting-houses, in the gas-works—and lastly of the stunning blows of the great steam-hammer—we beg leave to offer them a cup of black tea at the Company’s public refreshment-room, in order that, while they are blowing, sipping, and enjoying the beverage, we may briefly explain to them the nature of this beautiful little oasis in the desert. In dealing with the British nation, it is an axiom among those who have most deeply studied our noble character, that to keep John Bull in beaming good-humour it is absolutely necessary to keep him always quite full. The operation is very delicately called ” refreshing him;” and the London and North-Western Railway Company having, as in duty bound, made due arrangements for affording him, once in about every two hours, this support, their arrangements not only constitute a curious feature in the history of railway management, but the dramatis ‘persona we are about to introduce form, we think, rather a strange contrast to the bare arms, muscular frames, heated brows, and begrimed faces of the sturdy workmen we have just left. 1. A matron or generallissima. 3. Four men and three boys do. do. 4. One man-cook, his kitchen-maid, and his two scullery-maids. 6. One still-room-maid, employed solely in the liquid duty of making tea and coffee. 8. One baker and one baker’s-boy. There are also eighty-five pigs and piglings, of whom hereafter. The manner in which the above list of persons, in the routine of their duty, diurnally revolve in ” the scrap-drum ” of their worthy matron, is as follows:—Very early in the morning—in cold winter long before sunrise—” the odd-man ” wakens the two house-maids, to one of whom is intrusted the confidential duty of awakening the seven young ladies exactly at seven o’clock, in order that their ” premiere toilette ” may be concluded in time for them to receive the passengers of the first train, which reaches Wolverton at 7h. 30m. A.m. From that time until the departure of the passengers by the York Mail train, which arrives opposite to the refreshment-room at about eleven o’clock at night, these young persons remain on duty, continually vibrating, at the ringing of a bell, across the rails—(they have a covered passage high above them, but they never use it)—from the North refreshment-room for down passengers to the South refreshment-room constructed for hungry up-ones. By about midnight, after having philosophically divested themselves of the various little bustles of the day, they all are enabled once again to lay their heads on their pillows, with the exception of one, who in her turn, assisted by one man and one boy of the establishment, remains on duty receiving the money, &c. till four in the morning for the up-mail. The young person, however, who in her weekly turn performs this extra task, instead of rising with the others at seven, is allowed to sleep on till noon, when she is expected to take her place behind the long table with the rest. The scene in the refreshment-room at Wolverton, on the arrival of every train, has so often been witnessed by our readers, that it need hardly be described. As these youthful handmaidens stand in a row behind bright silver urns, silver coffee-pots, silver tea-pots, cups, saucers, cakes, sugar, milk, with other delicacies over which they preside, the confused crowd of passengers simultaneously liberated from the train hurry towards them with a velocity exactly proportionate to their appetites. The hungriest face first enters the door, ” magna comitante caterva,” followed by a crowd very much resembling in eagerness and joyous independence the rush at the prorogation of Parliament of a certain body following their leader from one house to the bar of what they mysteriously call ‘ another place.’ Considering that the row of young persons have among them all only seven right hands, with but very little fingers at the end of each, it is really astonishing how, with such slender assistance, they can in the short space of a few minutes manage to extend and withdraw them so often—sometimes to give a cup of tea—sometimes to receive half-a-crown, of which they have to return two shillings —then to give an old gentleman a plate of warm soup—then to drop another lump of sugar into his nephew’s coffee-cup—then to receive a penny for a bun, and then again threepence for four ” lady’s fingers.” It is their rule as well as their desire never, if they can possibly prevent it, to speak to any one; and although sometimes, when thunder has turned the milk, or the kitchen maid over-peppered the soup, it may occasionally be necessary to soothe the fastidious complaints of some beardless ensign by an infinitesimal appeal to the generous feelings of his nature—we mean, by the hundred-thousandth part of a smile—yet they endeavour on no account ever to exceed that harmless dose. But while they are thus occupied at the centre of the refreshment table, at its two ends, each close to a warm stove, a very plain matter-of-fact business is going on, which consists of the rapid uncorking of, and then emptying into large tumblers, innumerable black bottles of what is not unappropriated called ” Stout” inasmuch as all the persons who are drinking the dark foaming mixture wear heavy great-coats, with large wrappers round their necks—in fact, are very stout. We regret to have to add, that among these thirsty customers are to be seen, quite in the corner, several silently tossing off glasses of brandy, rum, and gin ; and although the refreshment-room of the Wolverton Station is not adapted for a lecture, we cannot help submitting to the managers of the Company, that, considering not only the serious accidents that may occur to individual passengers from intoxication, but the violence and insolence which drunken men may inflict upon travellers of both sexes, whose misfortune it may be to be shut up with them ; considering moreover the ruin which a glass or two of brandy may bring upon a young non-commissioned officer in the army, as also the heavy punishment it may entail upon an old soldier, it would be well for them peremptorily to forbid, at all their refreshment-rooms, the sale by any of their servants, to the public, of ardent spirits. But the bell is violently calling the passengers to ‘ Come! come away !’ —and as they have all paid their fares, and as the engine is loudly hissing—attracted by their pockets as well as by their engagements, they soon, like the swallows of summer, congregate together and then fly away. 5, 110 lbs. of moist sugar. To the eatables are to be added, or driven, the 85 pigs, who after having been from their birth most kindly treated and most luxuriously fed, are impartially promoted, by seniority, one after another, into an infinite number of pork pies. Having, in the refreshment sketch which we have just concluded, partially detailed, at some length, the duties of the seven young persons at Wolverton, we feel it due to them, as well as to those of our readers who, we perceive, have not yet quite finished their tea, by a very few words to complete their history. It is never considered quite fair to pry into the private conduct of any one who performs his duty to the public with zeal and assiduity. The warrior and the statesman are not always immaculate; and although at the Opera ladies certainly sing very high, and in the ballet kick very high, it is possible that their voices and feet may sometimes reach rather higher than their characters. Considering, then, the difficult duties which our seven young attendants have to perform—considering the temptations to which they are constantly exposed, in offering to the public attentions which are ever to simmer and yet never to boil—it might be expected that our inquiries should considerately go no further than the arrival at 11 P.M. of “the up York mail.” The excellent matron, however, who has charge of these young people—who always dine and live at her table—with honest pride declares, that the breath of slander has never ventured to sully the reputation of any of those who have been committed to her charge; and as this testimony is corroborated by persons residing in the neighbourhood and very capable of observation, we cannot take leave of the establishment without expressing our approbation of the good sense and attention with which it is conducted; and while we give credit to the young for the character they have maintained, we hope they will be gratefully sensible of the protection they have received. We quite forgot to mention that, notwithstanding the everlasting hurry at this establishment, four of the young attendants have managed to make excellent marriages, and are now very well off in the world. Before leaving Wolverton Station our readers will no doubt be desirous to ascertain what arrangements, if any, are made by the Company for the comfort, education, and religious instruction of the number of artificers and other servants whom we have lately seen hard at work. On the western boundary of the town we visited 130 plots of ground, containing about 324 square yards each, which are let by the Company at a very trifling rent to those who wish for a garden ; and, accordingly, whenever one of these plots is given up, it is leased to him whose name stands first on the list of applicants. A reading-room and library lighted by gas are also supplied free of charge by the Company. In the latter there are about 700 volumes, which have mostly been given; and the list of papers, &c. in the reading-room was as follows:— Times, Daily News, Bell’s Life, Illustrated News, Punch, Weekly Dispatch, Liverpool Albion, Glasgow Post, Railway Record, Airs’ Birmingham Gazette, Bentley’s Miscellany, Chambers’ Information, Chambers’ Journal, Chambers’ Shilling Volume, Practical Mechanic’s Journal, Mechanic’s Magazine. Besides the above there is a flying library of about 600 volumes for the clerks, porters, police, as also for their wives and families, residing at the various stations, consisting of books of all kinds, excepting on politics and on religious controversies. They are despatched to the various stations, carriage free, in nineteen boxes given by the Company, each of which can contain from twenty to fifty volumes. For the education of the children of the Company’s servants, a school-house, which we had much pleasure in visiting, has been constructed on an healthy eminence, surrounded by a small court and garden. In the centre there is a room for girls, who, from nine till five, are instructed by a governess in reading, writing, arithmetic, geography, grammar, history, and needlework. Engaged at these occupations we counted fifty-five clean, healthy faces. In the east wing we found about ninety fine, stout, athletic boys, of various ages, employed in the studies above mentioned (excepting the last), and learning, moreover, mathematics and drawing. One boy we saw solving a quadratic equation—another was engaged with Euclid—others with studying land-surveying, levelling, trigonometry, and one had reached conic sections. At the western extremity of the building, on entering the infant-school, which is under the superintendence of an intelligent looking young person of about nineteen years of age, we were struck by the regular segments in which the little creatures were standing in groups around a tiny monitor occupying the centre of each chord. We soon, however, detected that this regularity of their attitudes was caused by the insertion in the floor of various chords of hoop iron, the outer rims of which they all touched with their toes. A finer set of little children we have seldom beheld ; but what particularly attracted our attention was three rows of beautiful babies sitting as solemn as judges on three steps one above another, the lowest being a step higher than the floor of the room. They were learning the first hard lesson of this world—namely, to sit still; and certainly the occupation seemed to be particularly well adapted to their outlines ; indeed their pinafores were so round, and their cheeks so red, that altogether they resembled three rows of white dumplings, with a rosy-faced apple on each. The picture was most interesting; and we studied their cheerful features until we almost fancied that we could analyze and distinguish which were little fire-flies—which small stokers—tiny pokers—infant artificers, &c.
On leaving the three rooms full of children, to whom, whatever may be the religion of their parents, the Perpetual Curate, the Rev. G. Weight, is apparently devoting very praiseworthy attention, we proceeded eastward about 100 yards to the church, the property of the Radcliffe Trustees, the interior of which is appropriately fitted up with plain oak-coloured open seats, all alike. In the churchyard, which is of very considerable area, there are, under the north wall, a row of fraternal mounds side by side, with a solitary shrub or a few flowers at the foot of each, showing that those who had there reached their earthly terminus were kindly recollected by a few still travelling on the rails of life. With the exception, however, of the grave of one poor fellow, whose death under amputation, rendered necessary from severe fractures, has been commemorated on a tombstone by his comrades, there exists no interesting epitaph. Besides this church, a room in the library is used, when required, as a Wesleyan Chapel; at which on Sundays there are regular preachers both morning and night—and on Tuesdays and Fridays about 100 of the Company’s servants attend extempore prayers by one of their brother artificers. Sir Francis Bond Head, 1st Baronet KCH PC (1 January 1793 – 20 July 1875), is better known in Canadian history books than he is in this country. He was born to parents James Roper Mendes Head and Frances Anne Burgess and was descended from Spanish Jew Fernando Mendes, who accompanied Catherine of Braganza to England in 1662. His grandfather Moses Mendes married Anna Gabriella Head and took on the Head name following the death of his wife’s father. Francis was born into comfortable circumstances at Higham in Surrey. He entered the army and served from 1811 to 1825, retiring as a major in that year. He married Julia Valenza Somerville in 1816, and they eventually had four children. Subsequent to his army career he attempted to set up a mining company in Argentina and it was here that he earned the nickname “Galloping Head” for his rides across the Andes, although the nickname became apt to his diplomatic dealings. He seemed to be on the rise. He was appointed Assitant Poor Law Commissioner in 1834 and a year later Lieutenant-Governor of Upper Canada. Upper Canada was what later became the Province of Ontario. This was a difficult time for the colony who. like their American counterparts a generation earlier, were getting tired of arbitrary British rule. The reformers were well organized under a man called William Lyon Mackenzie and Head was seen as a man who could pacify the reformers. He appointed reformer Robert Baldwin to the Executive Council, though this appointment was opposed by the more radical Mackenzie. In any case he ignored Baldwin’s advice, and Baldwin resigned; the Legislative Assembly then refused to pass any money bills, so Head dissolved the government. 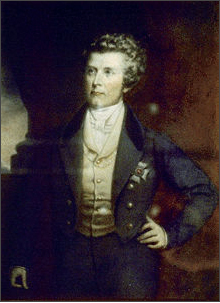 In the subsequent election campaign, he appealed to the United Empire Loyalists of the colony, proclaiming that the reformers were advocating American republicanism. The Conservative party, led by the wealthy landowners known as the “Family Compact, won the election. In December 1837, Mackenzie led a brief and bungled rebellion in Toronto. Head sent the colonial militia to put down the rebellion, which they did within a day. Head cannot be held primarily responsible for the rebellion of 1837 in Upper Canada, but his unprecedented interference in the election and his uncompromising hostility to the Reformers encouraged extremists, as did his decision to denude the colony of British troops. His excesses led to his recall early in 1838 and he never held office again. And this leads us to Wolverton. He settled down to writing books and essays once back in Britain. One of these books, Stokers and Pokers, published in 1849, gives us a lively and detailed account of his visit to Wolverton Station. More of this in the next post.